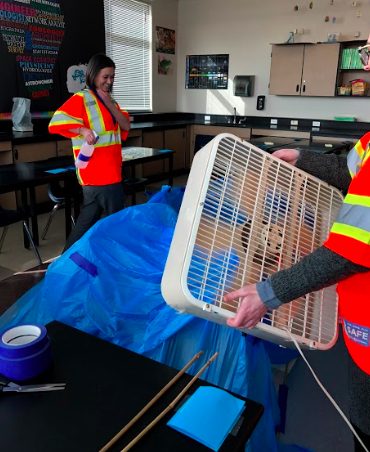 The young women at our Fox Ridge Middle School chapter recently welcomed engineers from Burns and McDonnell who explained what their jobs entail from designing projects to working on construction sites. Our group had a chance to build a shelter for engineers on a construction site using plastic bags and bamboo sticks. The students enjoyed the activity and their shelters were put to the test to see if they could survive through wind and rain. Even the teachers participated and had a blast! Today we met Michelle Lim, a freelance software developer and teacher. She shared her experiences of learning to code, building relationships with clients, and creating a variety of websites, apps, and art installations. We also learned a lot about the internet and modern web technologies. For example, Michelle showed us how she coded an app that displays random GIFs as a video stream, based on a list of keywords (aka tags). Her app used an API, which is a method of communication between two apps - in this case, between her app and giphy.com. As a group, we reprogrammed it with new keywords and background music to generate a unique music video! Then, our final activity was to design and code our own individual websites on codepen.io with HTML and CSS! We had so much fun getting familiar with each other and collaborating on Trashin’ Fashion – designing with upcycled materials in the spirit of sustainability, creativity, and innovation!